Buffalo (cow or ox) Chinese Zodiac Sign 2 vinyl decal - one color. 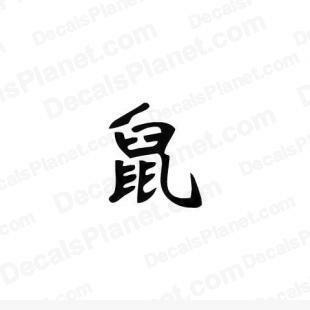 Dragon Chinese Zodiac Sign 1 vinyl decal - one color. Rat (mouse) Chinese Zodiac Sign 2 vinyl decal - one color. Dog Chinese Zodiac Sign 2 vinyl decal - one color. DecalsGround.com and its subsidiaries do not represent any manufacturers or other organization displayed in the online store. All vinyl decals are custom aftermarket. All the company or product logos included on this site are the trademarks or registered trademarks of their respective companies, and are provided as a convenience only for their lawful use. It is the expressed intent of Decals Ground that any unauthorized use of the aforementioned items by the purchaser shall be the sole responsibility of the purchaser. Purchase of any product from Decals Ground is not authorization for the use of any specific logo or trademark. By clicking "Add to Cart" you convey to Decals Ground you have authority (if need be) to use the above artwork. Most of the decals are added by users, if your logo appears on this site, contact us and we will remove it. Page generated in 0.008328 seconds.